Ethel M's Simply Perfect Gift Crate is a basket exclusively made for Simply Chocolate and is sure to impress! Filled with some of Ethel M's finest gifts in a collectible crate, this green-lit gift has a fresh, festive vibe for any occasion, any time of the year. But only if you want to seriously impress the recipient. 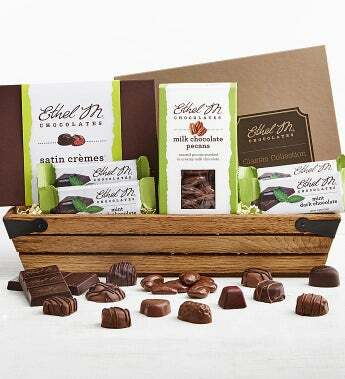 This handsome walnut stained wood crate includes Ethel M's famed Classic Collection, their flavorful Satin Creme Collection, Milk Chocolate Dipped Pecans, and a quartet of Dark Chocolate Mint Bars. It arrives in a clear gift bag tied with a sleek white bow.